12,840′ starting elevation. 2 hrs after dark. 50 skiers and riders. Level 3 teaching certification or patrol certifications required. What an awesome experience. Thanks SS Director John Buhler for putting it together. At Breckenridge, we celebrated 2006, then welcomed 2007 in high style. 12,840′ starting elevation. 2 hrs after dark. 50 skiers and riders. Level 3 teaching certification or patrol certifications required. What an awesome experience. Thanks SS Director John Buhler for putting it together. In fact, there were two torchlight parades going on simultaneously on Peak 9 and the top of Imperial Bowl on P8. We think this is a Guiness Book of World Record for the highest Torchlight Parade. It was certainly a special event. All the participants were eager, yet very aware of the Double Black Diamond terrain that had to be skied with a bamboo pole with lit flares on both ends. Oh, yeah, did I mention it was in the dark? At 5pm we loaded the Colorado Superchair on P8. From the top we made our first post-dusk turns. The full moon made the skiing to 6-chair quite entertaining. Great visibility for nighttime, no light skiing. We met at the Warming Hut between 6 chair and the Imperial Chair. We warmed up in the hut, and received our briefing from John Buhler. I don’t think anyone really thought about the highest Torchlight parade. Rather the energy was great. Lots of fun. Plenty of smiles. After receiving our instructions, it was time to get the bamboo and 2 flares. Patrol dispersed each participant their tools for the night. We then loaded the Imperial Express to take us to the summit. This is a fun shot at 12,840. I called Sadie and the kids to look out the window and see dad on the mountain top. Very fun. After synchronizing the torchlight with P9, it was time to go. It took about 30 minutes to ski and ride down the Imperial Ridge, then Horseshoe Bowl. When we finally made it through the bowl. It was time to pick up the pace down Northstar to the bottom of P8. There was applause from the Ski Watch condos. And giving high-fives to the awesome kids at the bottom was a great time as well. After all, that is who we did this for in the first place. Thanks for coming to Breckenridge to welcome 2007. Great Photos of the torchlight parade. That really gives you an idea of what it was like up there! I was there with Jon, and it was just about the coolest thing I’ve ever done! I was on a snowboard, and the riding was excellent, and challengin at the same time. 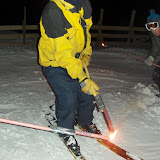 While we were riding and skiing with the torches, their light was so bright, you could see well right around the group. It was unusual to look up and see darkness and the lights from the town of Breckenridge now and then. We could look down on the Peak 9 Torchlight Parade happening at the same time also. What a great New Year’s Eve! Hpefully we’ll get to do it every year. I’m also going to post my few pictures from New Years Eve at mysnowpro.com/greggdavis too.